Along with my wine-drinking buddies, Gerry and John, we have scoured Philly’s Main Line for interesting BYOB’s for our monthly wine dinners. 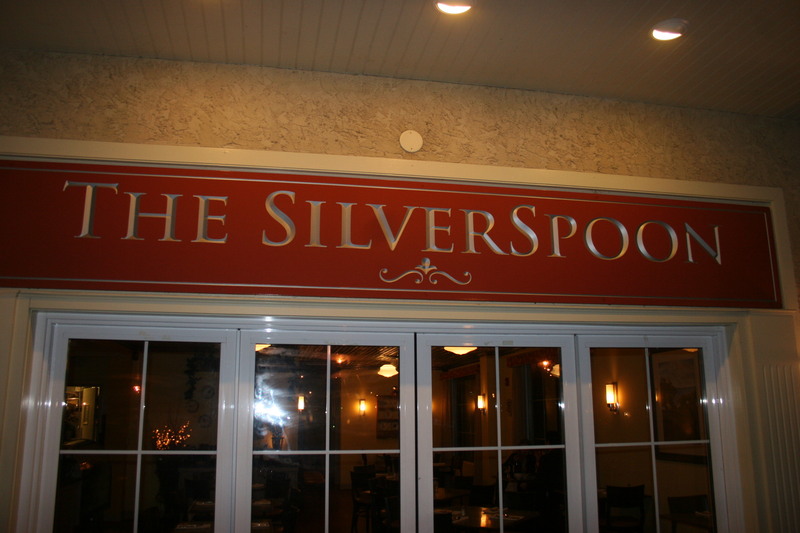 We are not quite sure how we missed the Silverspoon all this time but we are certainly glad we found it last Thursday night. It’s not like The Silverspoon is hiding, or that it’s location requires guide dogs and a new GPS. It’s located in the Eagle Village Shoppes on Lancaster Avenue in Wayne, PA.
On Thursday last, we were among several tables for our 6:00 P.M. seating. 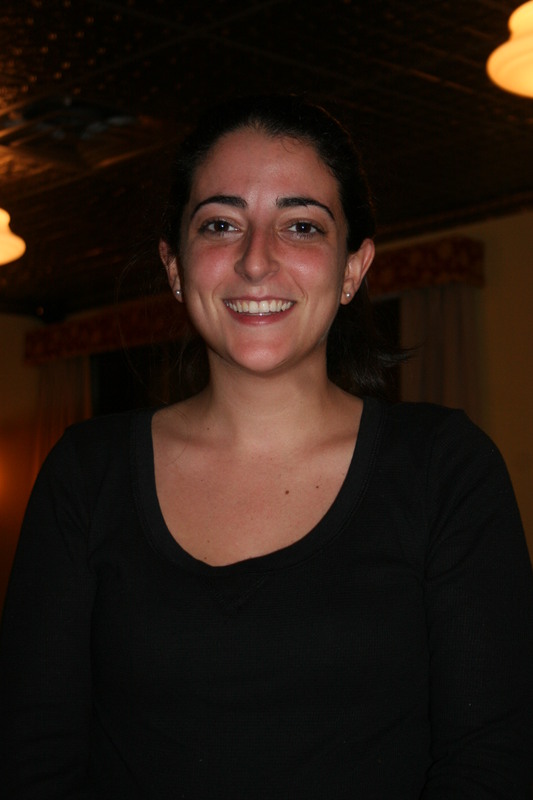 The restaurant has a pleasant, homey feel and our waitress, Caroline, welcomed us and provided us each with three wine glasses prior to opening our wines for the evening. As usual, we had some nice wines to enjoy with our meal. The very dark bottle on the left belonged to John. He has a tendency to bring very heavy, dark bottles because, apparently, someone told him that they LOOK expensive. This particular dark, heavy bottle was the 2006, Ehlers, “1886” , Napa Valley, Cabernet. This one scores well on Cellar-Tracker (almost a 93 average) and was the heaviest wine of the evening showing great color and dark flavors that mellowed a bit as dinner progressed. Gerry brought the 2005, E. Guigal, Chateauneuf du Pape with its classic Syrah, Grenache, Mourvedre combo that was drinking quite well with our meal. 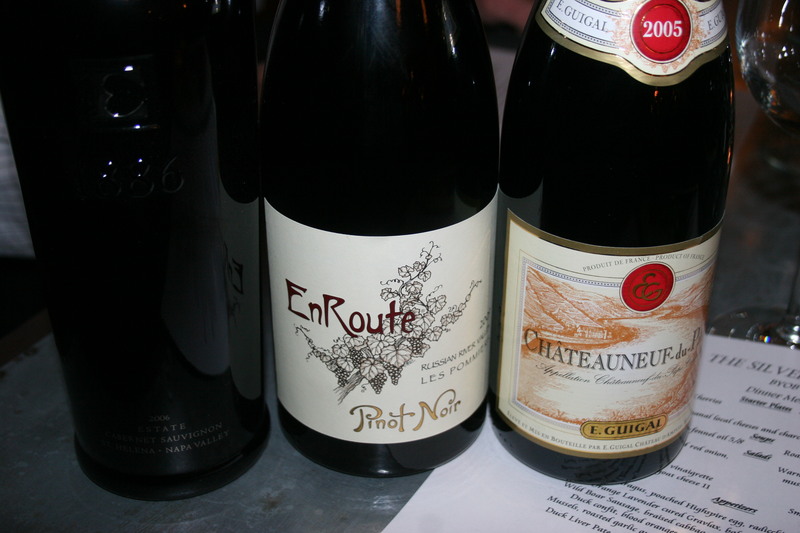 My contribution was the 2009, EnRoute, “Les Pommiers”, Russian River Valley, Pinot Noir. Nice flavors on this one with evidence of tart cherries and baking spices with a nicely balanced smooth finish. The EnRoute Pinot Noir is made by the folks who make the excellent Far Niente wines. This one went especially well with each of my dishes. 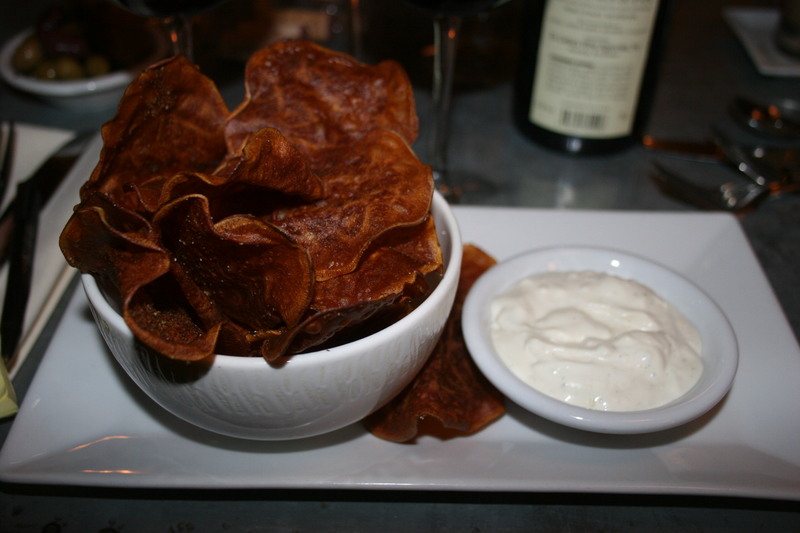 I almost feel a bit silly in raving over a $4.00 “starter” that was simply Sweet Potato Chips with a smoky blue cheese dip. These little tempting morsels of goodness were absolutely perfection on a plate. The chips looked so delicate and yet they held together well enough to absorb the “dip” which was out of this world. I seriously considered ordering a repeat and I have thought about this treat every day since we have been there. What a pleasant way to begin a meal! 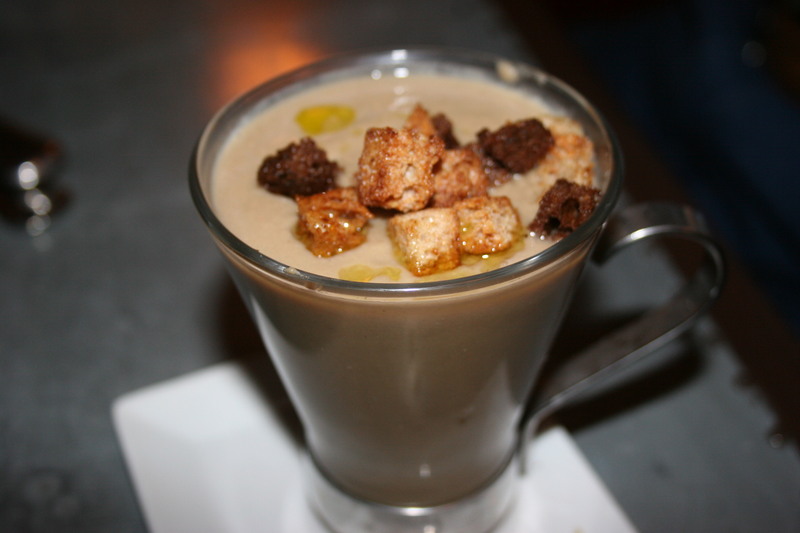 Gerry began with a Mushroom Bisque, seasoned croutons and an orange-fennel oil. He thought the soup was great. John had a dish of the marinated mixed olives. I have a picture of it but, seriously, it’s just a dish of mixed olives so use your imagination. If you thought I went slightly ga ga over the sweet potato chips (and maybe I did), you will find it hard to believe that my salad was, quite possibly, the most delicious salad I have ever eaten. That is an amazing compliment coming from me who was totally convinced that there were few things better on this earth than a fresh chunk of iceberg lettuce, with just the right amount of Maytag Blue Cheese dressing and smothered with tangy bacon bits and ripe tomatoes. 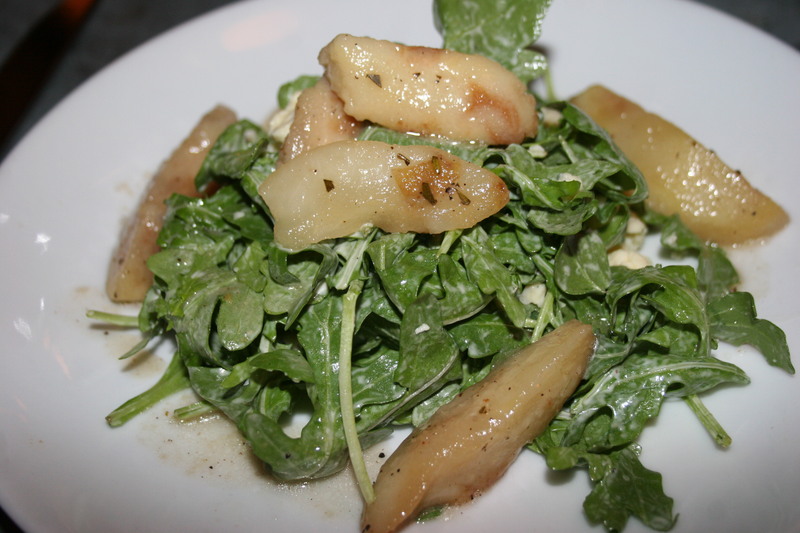 This one at The Silverspoon was baby arugula, honey roasted pears, goat cheese and herb vinaigrette. Wow, I savored each fantastic bite of this salad. My entree had not even made an appearance and I knew I could go home happy from this dining experience. My entree was good. I know that sounds like faint praise after my starter and my salad but it would have been nearly impossible to surpass those two items. 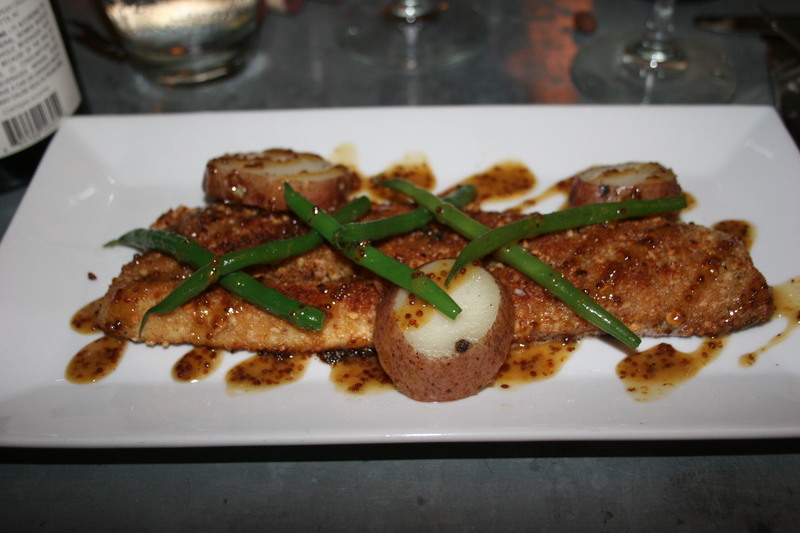 Had they not been so superlative, this sentence might have started “my entree was really good.” I ordered the Hazelnut-crusted trout, red bliss potatoes, haricot verts, sherry pommery mustard sauce. The fish was tender and flaky, the mustard sauce a great enhancer of the fish and the potatoes and green beans good. If I might throw in a very minor complaint, I would have preferred a few more red bliss potatoes on the dish. I ran out of what was there long before my trout disappeared. John gave me some of his garlic fries which was a help. This would be where his garlic fries that he shared with me came from. 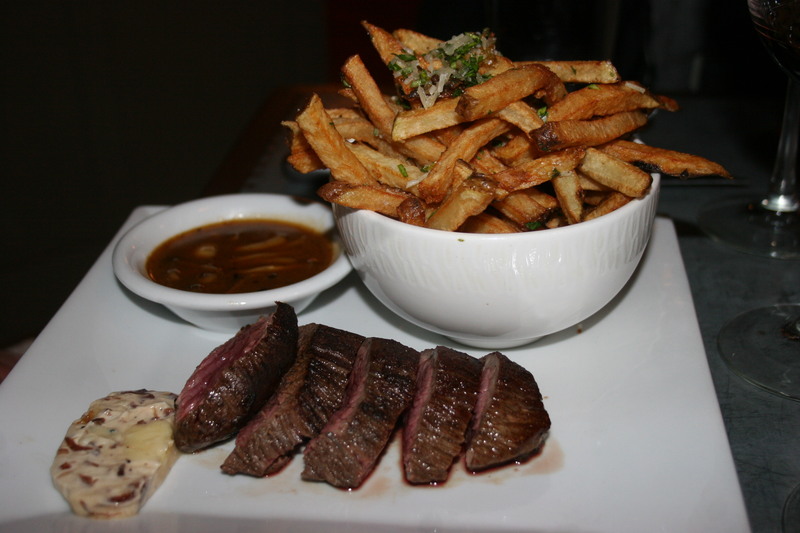 It’s the Tender Baby Filet of Beef with port wine shallot and smoked blue cheese butter with exotic mushrooms and house-cut garlic fries. For some reason, John didn’t use the port wine shallot sauce or the smoked blue cheese butter through the first half of his meal. I think he was trying to “eat healthy”. When he gave in to temptation and added those items to his filet, I think he really enjoyed the second half of his meal. I know the fries were delicious. Meanwhile, back at the ranch, Gerry was devouring his entree, the Lamb Crepenette (I heard Caroline describing what this was but it was lost on me), with green onion pureed potatoes and haricot verts. Gerry thoroughly enjoyed his dinner choice. 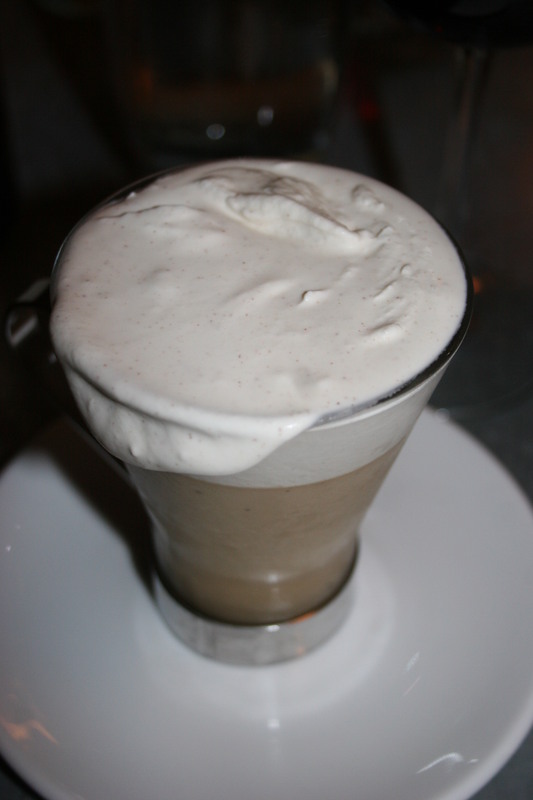 Although none of us needed it, we ended our meal with a dessert, an espresso flavored Pot de Creme. 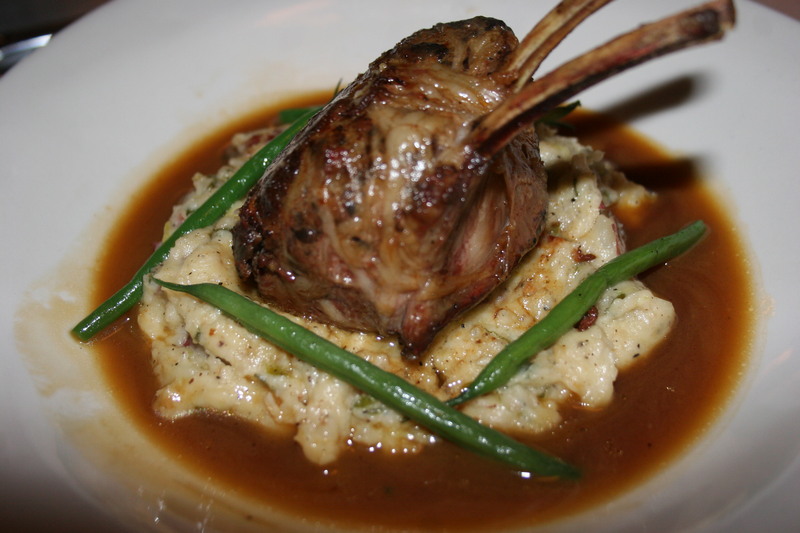 It was rich and flavorful and left us with little room to breathe. All three of us were absolutely thrilled with our discovery of The Silverspoon. The menu is interesting and diverse and Chef Tim Courtney, a graduate of the prestigious Culinary Institute of America in Hyde Park, NY, should be rightfully proud of what he creates each evening at this excellent Main Line BYOB.